1. Gymnastics – India would be hoping for a Gold medal from Ashish Kumar when he gets to the floor in Glasgow. Ashish had won silver and a bronze in the men’s floor exercises and vault in the 2010 Games in Delhi.In women’s draw India’s hopes for a medal rely on Dipa Karmakar. 2. Men Boxing – Here again India would be hoping to better their tally of seven medals which they won in the previous edition of CWG. India would be looking to better this number and they have the team to succeed. The medal prospects for India in Men Boxing include – Vijender Singh, L Devendro Singh, Manoj Kumar and Sumit Sangwan. 3. Women Boxing – The women boxing is making a debut in CWG. The Indian medal prospects in this event are Pinki Jangra, who qualified ahead of star boxer Mary Komand will compete in 51 kg category, Sarita Devi in 60 kg and Pooja Rani in 75 kg category. 4. Athletics –India would be competing in both men and women athletic events and has high hopes from Krishna Poonia who won gold in Women’s discus throw in Delhi CWG to repeat the heroics. The country is hoping for a better show from its largest team in the event and medals are expected from Vikas Gowda in Men’s Discus throw, Kamalpreet Singh in Men’s Hammer throw, Annu Rani in Women’s Javelin throw and from men’s 4 x 400 Relay team that comprises of Rajiv Arokia, Kunhu Mohammed, Sachin Roby, Lalit Mathur, Jithu Baby, Jibin Sebasti. 5. Shooting – This is one event where India would be hoping to strike rich and better its tally of 14 gold, 11 silver and 5 bronze medals, the team won in Delhi four years back. Vijay Kumar, India’s Olympic silver medalist pistol shooter, Gagan Narang and Omkar Singh are all expected to better their individual tally of three medals each, they won in last CWG. Medals are also expected from Abhinav Bindra and Manavjit Singh Sandhu in men’s event and Heena Sidhu,Meena Kumari and Anisa Sayyed in women’s event. 6. Table Tennis–India’s challenge in table tennis will be spearheaded by Sharath Kamal, a gold medalist in the last two commonwealth games. Sharath will be assisted by Soumyajit Ghosh and Harmeet Desai in the men’s event. India’s challenge in the women’s category will be led by K. Shamini. 7. Badminton -India is pinning their hopes on P V Sindhu and the pair of Jwala Gutta and Ashwini Ponnappa to replicate their success in badminton that they achieved in 2010. 8. Wrestling– This is the most anticipated event from the Indian point of view. The Indian contingent is led by two time Olympic medalist Sushil Kumar and bronze medalist at the London Olympics Yogeshwar Dutt. The team also has both,Pawan Kumar and Satyavart Kadian, who won gold at Commonwealth Wrestling Championship in South Africa last year. In Women’s category India’s hope rest on Babita Phogat. 9. Weightlifting – India would be looking to add on to their total of 8 medals they won in last CWG. Leading their campaign would be Katulu Ravi Kumar and Sukhen Dey in men’s category and Sanjita Chanu and Vandna Gupta in women’s category. 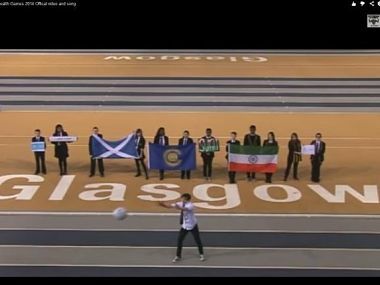 With less than 24 hours to go for the opening ceremony of the Commonwealth Games in Glasgow, several members of the Indian contingent reportedly still haven't received their ceremonial dresses for the parade. Some athletes are reportedly wondering whether they will be given the ceremonial dresses at all. "We have just received the India blazer with Glasgow Commonwealth Games embossed on them. We should have got the dress before we left India," one athlete, a veteran of three Games was quoted as saying by the Times of India. The Indian chef-de-mission - Raj Singh - meanwhile, conceded that there was some delay in the arrangement of ceremonial attire for the Indian contingent but said he was confident that all the athletes would get them in time. "The IOA Committee to decide on this issue of ceremonial dress which included myself delayed a bit in taking a decision. But it is not an issue and all the athletes will get the ceremonial dress for the opening ceremony," Raj Singh told PTI. "We have already given the sports kits, including track suits, shoes, bags etc. But I think some athletes are yet to get the ceremonial dress for the opening ceremony. But all of them will get the dress today." He said men members will wear a black blazer, gray trouser and Hush Puppy shoes along with the traditional turban. "Women athletes will wear saris and we have three sets of saris with us. We will decide which one will be used," he added. With the 20th edition of the Commonwealth Games just hours away, India are aiming for a top-three finish. India achieved unprecedented success in the last edition, amassing 101 medals to finish second. This time around the expectations have soared even higher. let me file a drain inspectors report. the apartments/accomodations are very small and I believe 6 athletes are crammed into each unit. there is also no attached bathrooms, but shared bathrooms. the indian contingent and media is being polite as usual giving the low-achieving organizers a clean chit, a courtesy which was not extended to new delhi. Why do we even bother being a part of this circus? ^ Indian Players get at least some avenue to showcase their talents otherwise only officials will goto this circus on public exchequer. There's been a norovirus epidemic at the games village. Several athletes fell sick. Paddy Barnes, the Olympic medalist boxer, complained bitterly about the random drug testing official who made him wait from 8pm to 2am to collect samples, before finally letting him go dehydrated and sleep deprived. typical english mismanagement and red tape. Scottish, not English. However, I would be happy to put any failure done by Scots on the laps of the English. PPCeee fears that English players will be boooooooood by Scotish spectators. They are Scots. They're seldom sober to begin with. Suraj wrote: There's been a norovirus epidemic at the games village. Several athletes fell sick. India wins gold and silver in 48kg womens weightlifting. Our ladies were several kilos ahead of the Nigerian bronze winner. Satisfying start. Both are from Manipur. But a long way to go in world stage as for the weights lifted (200 kg+ vs 170 Kg+). There is no need to peak now. Asian Games is in October and standard is much higher in this sport there due to China/Japan/SoKo. Do what's necessary to win gold and be done with it. We have two judokas fighting for gold and two more for bronze, in a few minutes. The judokas lost in the finals but I think we have progressed in judo. I don't remember us winning much in the last event or did we? Judo was not included in 2010 or 2006. It was included in 1990 and 2002. We won a couple of bronzes in 1990 and a silver and bronze in 2002, so we're already at our best ever performance with 2 silvers so far. for the first time, saw some beautiful indian gymnasts. awesome. made me proud. go india! Where can we watch these games online? Gold and bronze to India in mens 56kg weight lifting. Good performance so far. We had 2 golds in Delhi 2010 in weightlifting, so we have already matched that performance by day 1. 2 silver and 1 bronze in Judo is also a CWG record performance and this is just the first day. Would have been nicer is one of those was gold. The ladies 48kg silver medalist is just 19 and this will be a morale booster to her. lets hold off celebrating on weightlifting medals. a lot of doping went on in our fraternity there. ofcourse all are doing it, but we were getting routinely caught in large clumps need to await the all clear from the post-medal mandatory samples taken. Matsa wins bronze in women's weightlifting. We underperformed in womens 10m air pistol. Only a silver behind Singapore. Heena Sidhu was way off the medal bracket today. Should have been gold+silver for us. Nanjappa wins silver in shooting. Chandela gold, Paul silver in women's air rifle shooting. Sarnobat and Sayyed to fight for gold and silver - shooting. We have 4 judokas fighting for bronzes today. Too bad none of them made the final. Hope a couple of them pick up a medal. Their performance is just good enough to be underwhelming, wishing one would win a gold. I see others have progressed in weightlifting while we are stagnant or gone down. and the kit is awesome! The games website is useless. No updates at all in the last hour. Bronze for Omkar Otari in Mens 69kg weightlifting. Shreyashi Singh wins silver - double trap shooting. in some areas like athletics track n field, cycling, swimming the CWG std is at OG level (due to superpawa like jamaica, kenya, aus, eng). rest of it is patchy and definitely below AG level due to AG having the Dragon+SK+Japan but in AG the track n field, cycling, swimming is below OG level while shooting, archery, gymnastics is OG level. Asab Mohd. wins bronze in men's double trap shooting. Poonam Yadav wins bronze - weightlifting.